When I try to update the firmware it locks up with CPU usage at 30%+. It just keeps spawning cmd.exes indefinitely (if I left it, it would fill up all my 16GB of RAM). 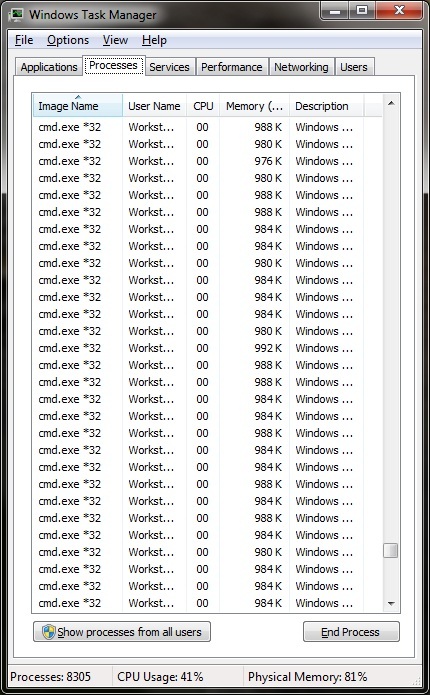 When I end task, the updater goes away, but the cmd.exes keep multiplying. - I disabled one controller before attempting to update. - I tried it with drivers installed, and without. - Nothing attached to USB 3.0 ports. Mouse and keyboard are in the yellow 2.0/ESATA hybrid ports. i dont know much about this sorry,but did you try booting up into safe mode and update it that way? Nice to see you solved this! I've never seen or heard of it, so thanks for posting back the cause and solution!